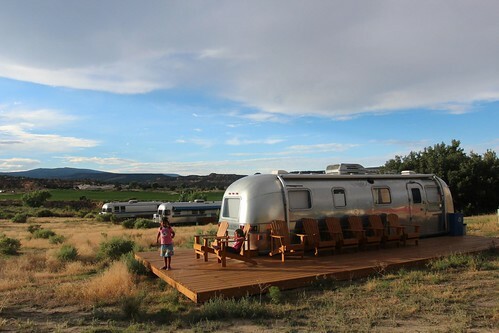 Mali Mish - Day 5: Escalante, Utah and the Shooting Star Airstream Park. 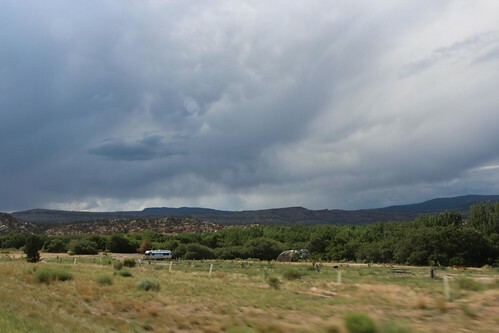 Our destination today is Escalante, Utah. It’s a little town in the Grand Staircase-Escalante National Monument region of just over 800 residents. 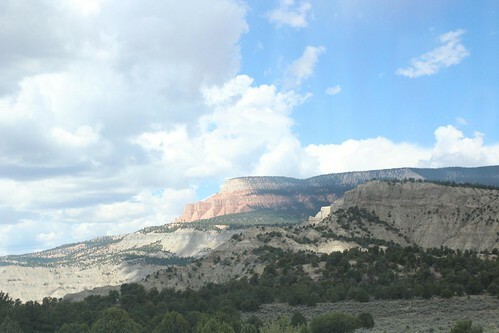 The drive from Panguitch to Escalante is yet again a breathtaking experience. You traverse through the high-desert and lower pine forest ecologies several times as you make your way through Highway 12. There are a couple of towns in between but all of them are smaller than Panguitch. 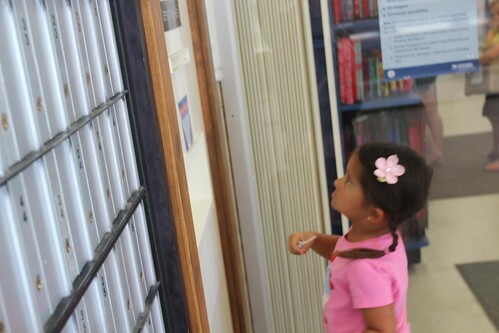 Before we headed out of town, the girls dropped by the local post office to send off some posts cards. So if you think you are that special someone who’s getting one, keep your eyes out for the mailman. I would have to say that driving through small towns and 2-lane roads are the only way to see this country. There is nothing else quite like it. 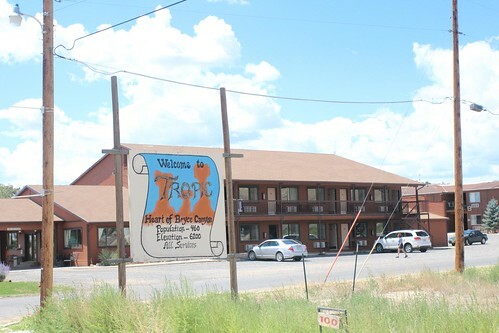 First town we drove by as we passed Bryce Canyon is a little place called Tropic with about 500 residents. Most of these towns around here cater specifically to tourists who are here to see some of the greatest National Parks we have in the United States. 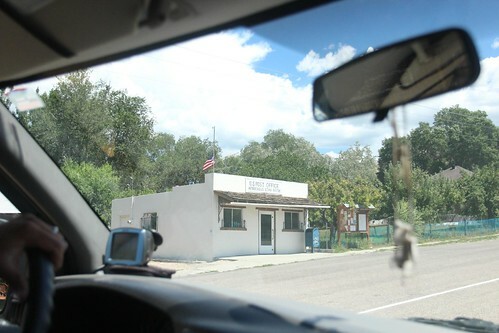 They had an even smaller post office than Panguitch. 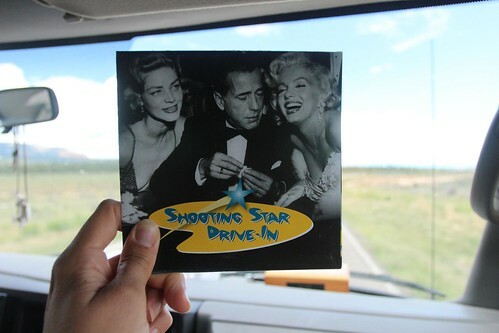 Last spring when we went to the Vintage Trailer show in Palm Springs, we got a pamphlet from the owner of Shooting Star Drive-In in Escalante, Utah. 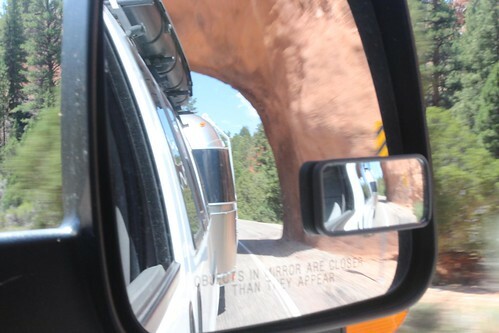 When we decided to drive through here on our way to Denver, we were excited to have an opportunity to for a visit. The east side of their property is where the RV park is located. There are about 20 sites that are half electric and water and the other half with full hook ups. We opted for 2 nights with just a electric and water site for $30 a night plus tax. 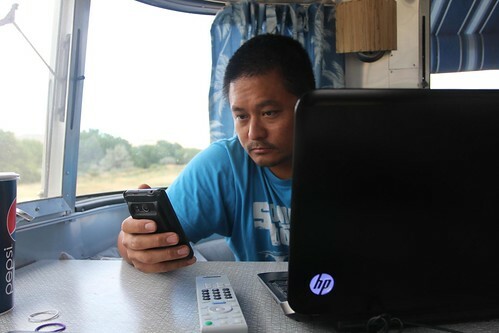 We discovered that phone and internet service here isn’t great so we cannot stay too long. After we unhitched the Mish, we drove into town. Once again, hardly anything was open. 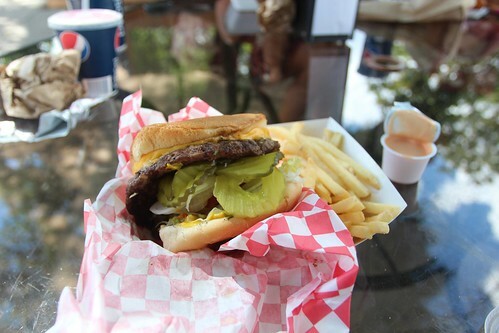 At the east end of town, we found a little burger stand called Nemo’s. We didn’t expect much but we were pleasantly surprised by the quality of their food. 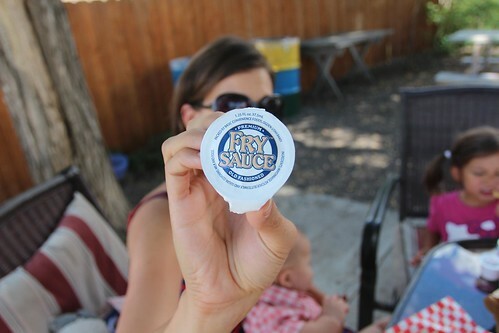 In Utah, people dip their french fries in fry sauce instead of ketchup. I guess it makes sense. Fries in fry sauce. It is a mixture of ketchup, mayonnaise, buttermilk and some other ingredients. Kind of like a thousand island dressing. You know the place is good when there are a lot of flies. Those pesky creatures know where all the good eats are. Even though we didn’t have a table cloth to eat on, Luka was wearing one as a shirt. 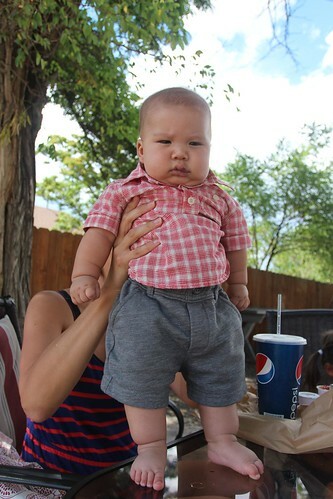 He is now wearing 12-month old cloths at not even 4 months. The town of Escalante was named after an European explorer. Even though he never actually settled here, he was one of the first explorers in the region. The town is named in honor of him. 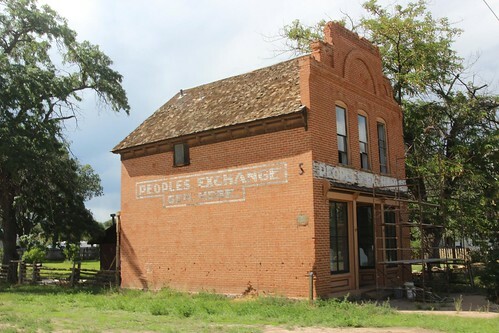 A lot of the pioneering day structures are still standing today like this place where people use to barter goods. 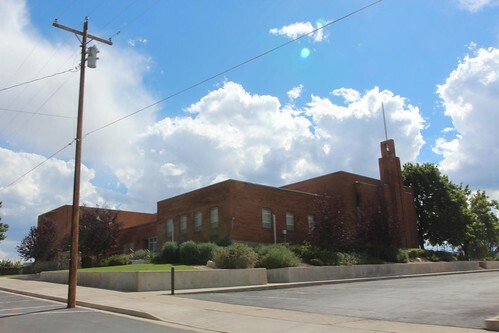 And of course, this is Utah after all, the biggest building in the town is the LDS church. I think the whole town can probably fit in here. They probably do on every Sunday. 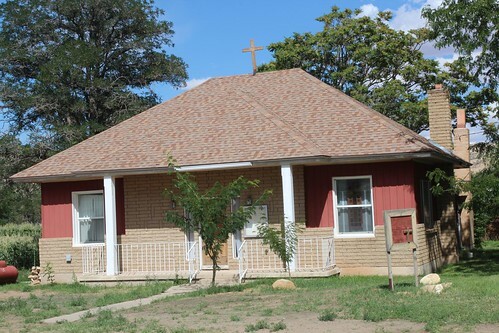 And if you happen to not be of the Mormon faith, just across the road, there is a Catholic church as well. You can probably also fit all of the Catholics in town. All 4 of them, who probably already live in this house. We are the only people at the RV park. 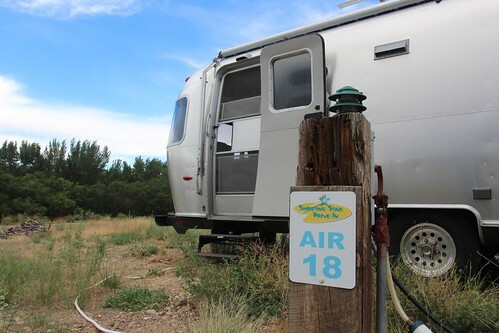 On the other side of the campground is where the permanent Airstreams are as well as the drive-in theater. I am guessing probably about 3 out of the 9 Airstreams onsite are occupied. Getting work done here is going to be tricky. The Internet seems to be crawling at dial-up speeds. 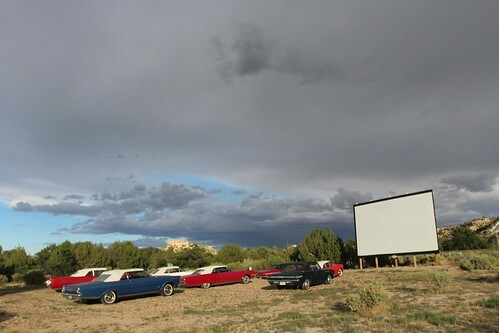 Every night, this drive-in movie theater plays an old black and white movie. Tonight, we are watching ‘This Gun for Hire’ featuring Alan Ladd and Veronica Lake. All of the onsite Airstreams here have been converted to have no holding tanks so there are less systems to maintain. They also all have wrap around decks with matching Adirondack chairs. This one is the unit right next to the movie screen so on a warm summer day, you can just sit on the deck and enjoy the show. 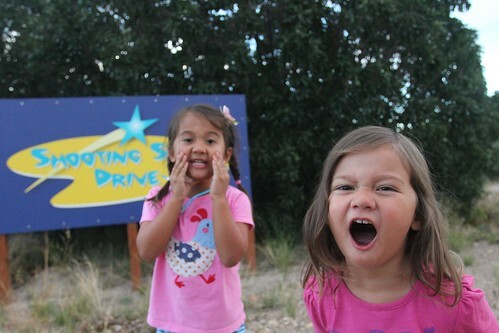 The girls are excited to be going to their first drive-in movie. Although it wasn’t without some drama as we were getting ready. We first got them in their pajamas so they can come back and go straight to bed. 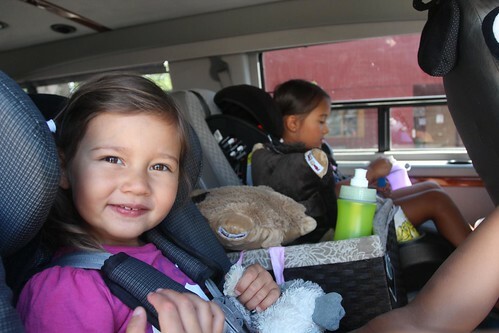 While we were sitting in the Mish and getting ready to go, Mila kept staring out the window into empty campground. She proceeded to cry about the men who are outside in their underwear. We looked out to see what she was talking about but we could see nothing. No men. No underwear. Needless to say, we were a little spooked. When Ava was 1 and 2 years old, she also has talked about people who weren’t there. During our visit to Mobile, Alabama in 2010, she looked into an empty storefront at night as we were walking back to the Airstream from dinner and asked us about why people are having a party in there. Ava’s encounters eventually went away as she got older but this is the first time Mila has talked about invisible spirits. 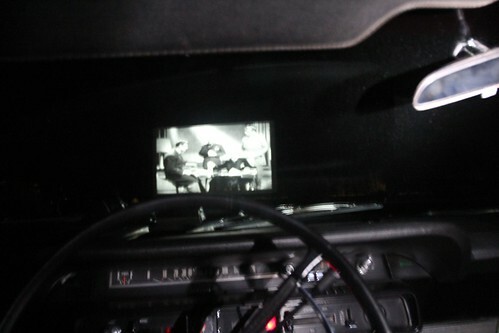 After much convincing, Mila finally agreed to head over to the drive-in in the dark. She had her head buried in my shoulder the whole way there as we walked. Now we just need to pick a car to sit in. OK, time to be quiet now. The movie has started. 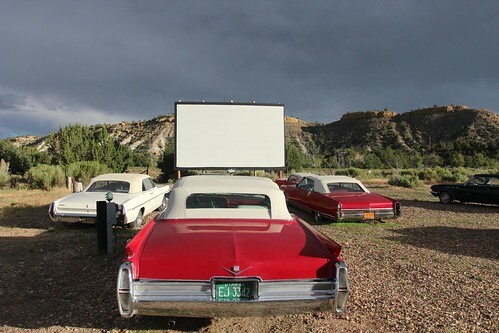 4 Responses to Day 5: Shooting Star Drive-In and Airstream Park at Escalante, Utah. We took the same route and visited the same National Parks in May! We are traveling in a 62 Safari. We love to read your blog. Thanks for sharing! campers? anyway-looks like a beautiful drive. we didnt make it down that way on our last adventure. perhaps on the next one! That drive in is really cool. I like how they have the cars. The girls reaction to the cricket was priceless. Love the stories, keep them coming.